Early this morning, we mentioned Wal-Mart's (WMT) monthly sales data, as well as the rest of the retail sector. 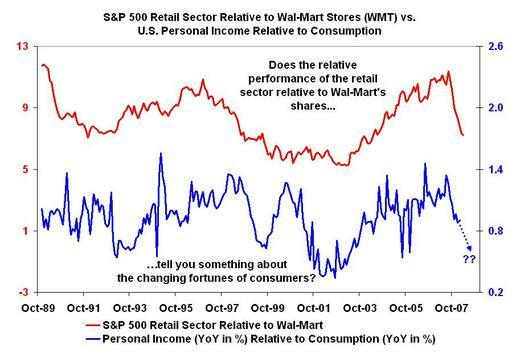 Michael Panzner sends along the following chart, asking: "Does the performance of the retail sector relative to Wal-Mart's tell you something about the changing fortunes of consumers? Look at the attached chart and decide for yourself. Heck, I have a business myself and I see the decline every day. We do photos of youth sports players and a lot of it is in the Southern California areas. Year over year sales are generally way down. Parents are buying less photos and less add on novelity items (trader cards, magazine covers). It is the largest year over year decline I have seen in 20 years. Something is up. Parents are buying less photos of their kids!!! Well...I know, it is a limited data point, Wal Mart we ain't. But hey, interesting isn't it.